IARC moved quickly after learning that Ahlbom is a director of his brother's consulting firm, Gunnar Ahlbom AB. The company, which is based in Brussels, the European capital and a center for lobbyists, was established to help clients on telecom issues, with an emphasis on environmental and energy regulations. Ahlbom failed to mention this sideline in his "Declaration of Interests" that is required of all those who participate in IARC cancer assessments. Apparently, IARC offered to allow Ahlbom to attend this week's meeting but only as a non-voting "invited specialist." Ahlbom declined to attend under those terms. He recently filed an amended declaration of his potential conflicts. Mona Nilsson, a Swedish journalist who has written two books on mobile phones and health, unearthed Ahlbom's connection to his brother's company. She was about to post a press release on what she had found out when Ahlbom announced he would not be going to the IARC meeting after all. Nilsson says that this is good news. "Ahlbom absolutely should not be on the IARC expert group," she told Microwave News. Two American scientists, who work on RF issues and had heard the news, said in separate interviews that they agree with Nilsson. "I am glad that IARC is abiding by the standards for conflicts of interest," said one. Both asked that they not be identified by name. Ahlbom did not respond for a request for comment. IARC officials also did not reply to e-mails from Microwave News. Anders Ahlbom, the head of the Karolinska's Institute of Environmental Medicine in Stockholm, is arguably the most important epidemiologist studying mobile phone radiation in Europe. He has spent much of his professional career on the effects of various types of electromagnetic fields and played a key role in establishing that power line EMFs are associated with childhood leukemia. Ahlbom chairs or sits on a variety of important committees that set research priorities and distribute research funding, both in Sweden and in the European Community. He was a member of ICNIRP for 12 years and continues to be one of its consulting experts. Ahlbom and his protégée, Maria Feychting, work on the ongoing Interphone project, which is coordinated by IARC, as well as the COSMOS project, a prospective study of mobile phones users. Ahlbom also chairs a committee that issues annual EMF/EMR status reports for the Swedish Radiation Protection Authority. For some years, Ahlbom has been saying that cell phones are unlikely to lead to tumors. "We have no reason to believe that there would be such risks," he declared in a recent interview. Such statements have made him a favorite among those in industry and government that seek to appease an anxious public and a lightning rod for those who see the published literature —including work by Ahlbom himself— as pointing to a cancer risk. "Anders Ahlbom's links to the telecom industry through his brother and their common company is a straightforward explanation of his systematic denial of health risks from mobile phones," Nilsson states in her press release. Lennart Hardell, a Swedish researcher who has published a number of studies pointing to higher rates of tumor among users of mobile phones and who has crossed swords with Ahlbom many times over the years, said that he was not surprised by Ahlbom's link to industry, only that it was so obvious. "Ahlbom has denied or ignored brain tumor risks from mobile phones and more or less acted as a spokesman for industry," Hardell said in an interview. Hardell is a member of the IARC panel and will be in Lyon this week. Ahlbom was widely rumored to have been selected to be the head of IARC's epidemiology subgroup at the cancer assessment. Jack Siemiatycki is now said to have that position. Siemiatycki is with the University of Montreal and is also a member of the Interphone project. 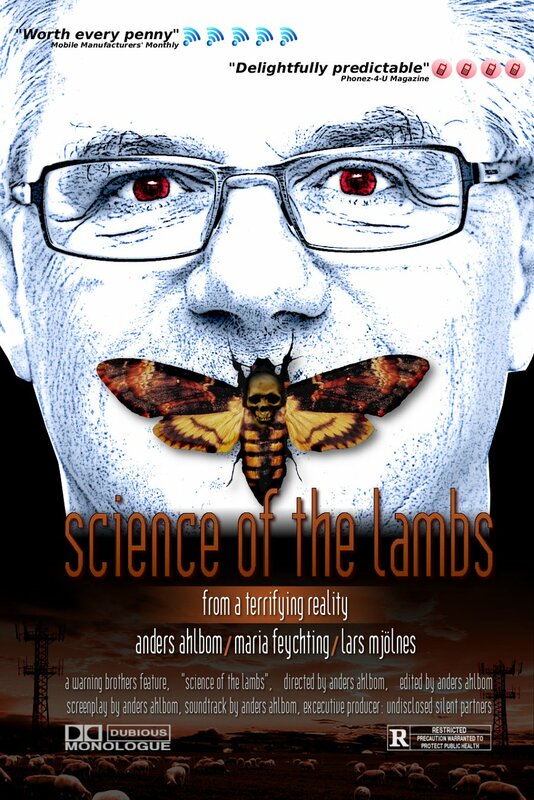 As a measure of Ahlbom's low standing among European activists, last week a U.K. group, circulated a simulated movie poster putting Ahlbom in "Hannibal Lechter land" to mock his views on cell phone health risks.